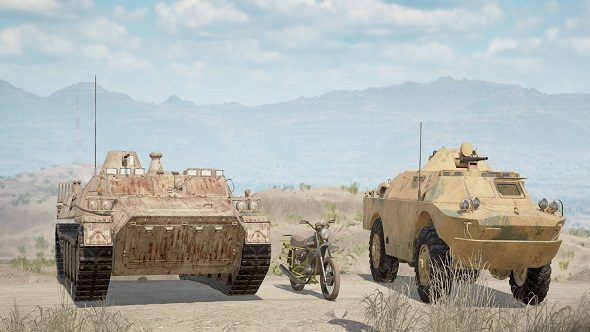 Ahead of its deployment, Offworld Industries have briefed squaddies about what to expect in the upcoming Alpha 9 update for the 50v50 military simulator. Along with a whole host of new vehicles for multiple factions, this update adds a new scoreboard and changes to the Forward Operating Base system. If you looking for military or arcade FPSes, this list of PC shooters should sort you out. The Russians have earned the most new military hardware in this update, gaining a new transport, a new logistics vehicle and three new armoured fire support vehicles. The transport and logistic vehicles are updated versions of the standard Ural truck, gaining a better performing engine and slightly different front end. The new BTR-82A is a heavier version of the BTR-80, complete with better blast protection and armour piercing rounds which offer the highest penetration value out of any other ammo in the game. If you think there are enemies in a building, just point the BTR’s cannon at it and keep firing. The other two Russian vehicles as modified MTLBs, designed as low profile armoured vehicles for when BTRs would make too much noise. The Militia got most of the Russians’ scraps, inheriting the BTR-80 and two MTLBs. One of the MTLBs is armed with a heavy machine gun, while the other has a 30mm cannon which finally gives the Militia some form of heavy ordinance. The Militia also got the BRDM-2 Scout Car, meaning you can move troops about while also providing decent fire support with its heavy machine gun. The Insurgents seem to be sharing the BRDM-2 Scout Car with the Militia, while also getting their own MTLB. This armoured transport is equipped with light armour and a regular machine gun, meaning that it’s mainly suited for taking out exposed infantry and unarmoured vehicles. Speaking of unarmoured vehicles, the Insurgents now have a motorbike. Great for flanking snipers parked up on hills or setting up your own ambushes, the bike will become a useful asset for Insurgents trying to quickly set up minefields. Finally, the Americans have received the heavily armoured Stryker ICV troop carrier. Mainly used for driving troops right to the frontline, only engage this carrier if you have a coordinated attack squad with you or a really big gun. As for the FOB changes, radios now allow you to build a spawn point, rather than the radio itself being the spawn point. You now have to build a hideout near the FOB, which acts as a rather obvious but protected bunker that troops will spawn in. You can’t really hide FOBs in a bush away from enemy fire anymore so it requires substantial reinforcement to make a spawn area safe. This means it will take more than one dedicated soldier with a belt full of bullets to take out an FOB, due the the amount of troops that will be reinforcing that area. Finally, the new scoreboard breaks down player scores more accurately, as well as giving details on what kits each teammate is using and whether they are in a vehicle or not. This saves squad leaders from constantly radioing in to check on their squad status during an operation. You can read the full changelog, which includes changes to some maps, over on Squad’s official website. Squad is currently available on Steam Early Access for $39.99/£29.99 if you want to get boots on the ground right now.